S I G N & D I G I T A L G R A P H I C S • March 2018 • 69 same effect of laser engraving," he says. That way, when a new tenant moves in, it is simple to take the film off and begin again without having to replace the glass. 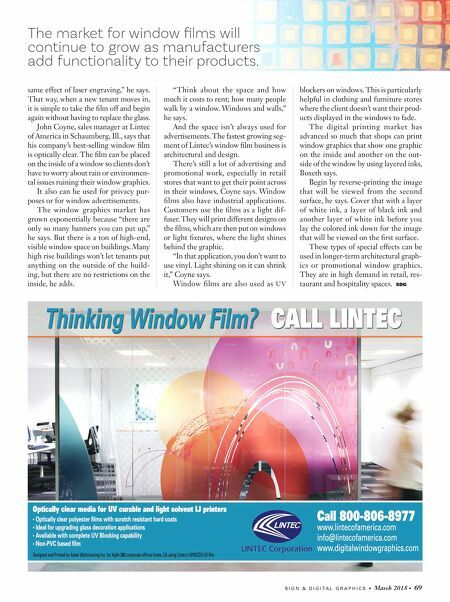 John Coyne, sales manager at Lintec of America in Schaumberg, Ill., says that his company's best-selling window film is optically clear. The film can be placed on the inside of a window so clients don't have to worry about rain or environmen- tal issues ruining their window graphics. It also can be used for privacy pur- poses or for window advertisements. 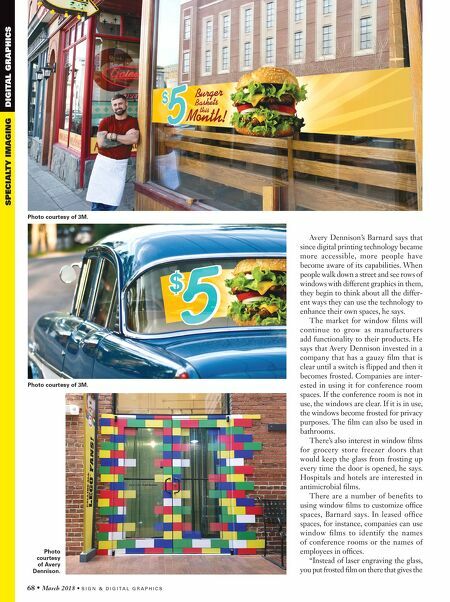 The window graphics market has grown exponentially because "there are only so many banners you can put up," he says. But there is a ton of high-end, visible window space on buildings. Many high rise buildings won't let tenants put anything on the outside of the build- ing, but there are no restrictions on the inside, he adds. "Think about the space and how much it costs to rent; how many people walk by a window. Windows and walls," he says. And the space isn't always used for advertisements. The fastest growing seg- ment of Lintec's window film business is architectural and design. There's still a lot of advertising and promotional work, especially in retail stores that want to get their point across in their windows, Coyne says. Window films also have industrial applications. Customers use the films as a light dif- fuser. They will print different designs on the films, which are then put on windows or light fixtures, where the light shines behind the graphic. "In that application, you don't want to use vinyl. Light shining on it can shrink it," Coyne says. Window films are also used as UV blockers on windows. This is particularly helpful in clothing and furniture stores where the client doesn't want their prod- ucts displayed in the windows to fade. The digital printing market has advanced so much that shops can print window graphics that show one graphic on the inside and another on the out- side of the window by using layered inks, Boxeth says. Begin by reverse-printing the image that will be viewed from the second surface, he says. Cover that with a layer of white ink, a layer of black ink and another layer of white ink before you lay the colored ink down for the image that will be viewed on the first surface. These types of special effects can be used in longer-term architectural graph- ics or promotional window graphics. They are in high demand in retail, res- taurant and hospitality spaces. SDG The market for window films will continue to grow as manufacturers add functionality to their products.